Browse our lovely collection of lime recipes, including Richard Corrigan's lime and mascarpone soufflé, Martin Wishart's lime-marinated flank steak, and Marcello Tully's avocado, lime and chocolate parfait. 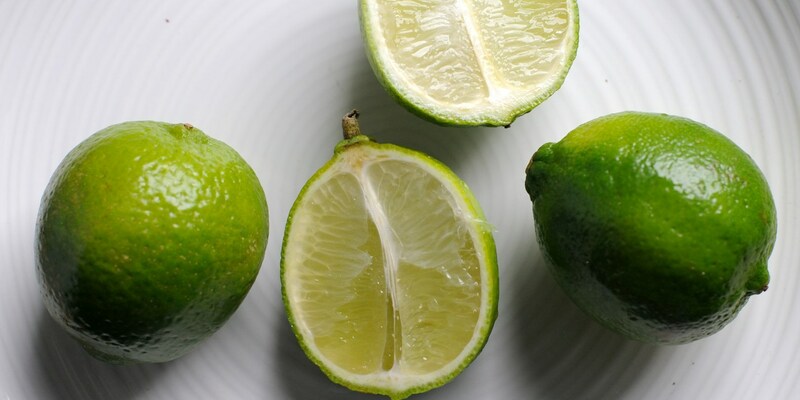 Bright and zingy, limes are a beautiful way to add a crisp, pine-citrus character to food and drinks. Southeast Asian and Mexican cuisine often pair lime zest or juice with the spice of hot chillies and herby punch of fresh coriander, but it is also perfectly at home partnered with coconut and other tropical fruits, such as in Alfred Prasad's mango salad recipe or in Richard Corrigan's passion fruit parfait with mango, lemongrass and lime. Limes, like lemons, are great for adding a vibrant, clean flavour to fish and seafood. Shaun Rankin's Yellowfin tuna with a lime and white radish dressing and Bloody Mary jelly recipe is a particularly tasty example. The scallop carpaccio with basil, coriander, mint and lime from Geoffrey Smeddle is full of fresh, exciting features for a truly exquisite and refreshing plate that's easy to put together. Although the ubiquity (and corruption) of the Cuban mojito has existed in bars for quite a long while now, the Brazilian caipirinha has only now started to break into the mainstream. For a fun take on the delicious lime cocktail, have a look at Marcello Tully's playful Caipirinha sorbet.